Begin in early February so that you have plenty of time to revisit businesses when managers/owners are away. Keep track of businesses you are visiting with your business list, found in your Campaign Package. Be sure to have managers sign their names before providing them with the stickers. Regularly visit your BrainLove Partner Businesses to see how they are doing and provide them with more stickers if necessary. Write your name clearly in the white box provided on each business instruction sheet and campaign brochure. 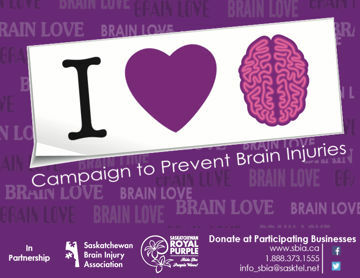 Hand out all of the campaign brochures and hang all your posters – this is a great opportunity to raise awareness about brain injuries. Be sure to thank every business for becoming a BrainLove Partner. Do not be upset if you are turned down. You are doing great work for your community! Canvassing does not need to be an independent venture. It should be fun and social, so consider gathering together a group of Royal Purple Members to canvas local businesses – You can even involve future members to teach them about volunteering and helping their communities. Keep your campaign package with you at all times – You never know when you might run into a store owner/manager and have the opportunity to talk about BrainLove.